LED used in automotive headlamps do not make much heat as they light up, but they create heat within the chip, or die, when the current passes through, which can include the cooling of nearby assemblies and connection cables. Therefore, LED headlamps need heat cooling systems, such as heatsinks or fans. Also, although these LED lights will last for a long time when they work at low currents and temperatures (as long as 25,000 to 100,000 hours), heat and current settings can extend or shorten this time span greatly. High-power LEDs are subjected to higher junction temperatures and higher current densities than traditional lighting devices. This puts stress on the material and may cause early light-output degradation. One of the main purposes in designing electronic packaging is good heat transport away from the device, downward through the package into the printed circuit board (PCB). The LED chip is connected electrically at its top and bottom, thus the electric circuit needs to be separated from the metal board by an insulator layer, which is neither electrically nor thermally very conductive. A new chip-on-board (COB) LED-array technology has been much popular in the past few years, enabling improved optical properties. For example, Samsung introduced several new COB proudction lines in mid-2015 with significant white-light and color-quality innovations. We studied the thermal behavior of this type of LED package, to compare their effectiveness with traditionally used materials. We also measured and simulated the influence of geometric parameters of the electrical layouts on thermal resistance. This value is so small that tripling the thickness to 105 μm leads to only a 0.01 K/W change. So why worry about the thickness? The answer lies in the effect of heat distribution, which is not represented by the formula above, but rather detected in measurement results. The heat flow of die reaches the copper layer and then is spread in the material. Compared to optics, the refraction at the boundary surface depends on the refraction index, which is the conductivity in the thermal picture. The chip connection to a highly conductive material results in a high refraction angle , so that a high spreading influence should be made. By increasing the copper layout thickness, the surface A, through which the heat passes, gets larger. Now, we can calculate the next thermal resistance with the simple formula again. Both the experimental and simulation results prove that the total thermal resistance with a thicker copper layout is lower. That is because heat flows into the dielectric through a higher effective surface area. So the dielectric presents a smaller thermal resistance. 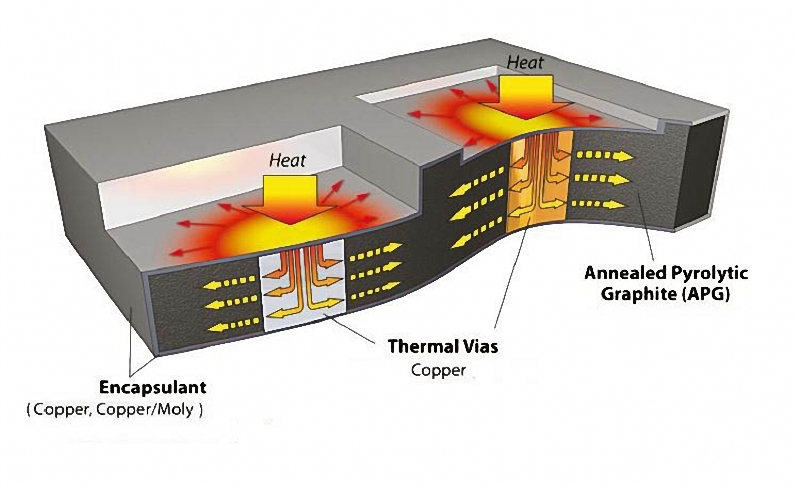 A higher thermal capacity should be achieved because a thicker thickness means more material. Very thin layers take a long time to simulate, and so the thicknesses of glue and dielectric are different for the test devices. The trend of lower thermal resistance and higher capacity by enlarging the copper layout thickness appeared in both the measurement and simulation data. We agreed that the total thermal resistance with a thicker copper layout is lower. Changing the PCB dielectric substrate material can make the biggest influence on the total thermal resistance of the LED package too. In the future, the aging behavior and reliability of both materials are interesting aspects that should be analized further.